Pannido sandwiches are back at Jack in the Box for a limited time at participating restaurants. The sandwiches were first introduced in 2004 but were eventually discontinued. As before, Pannidos come on a toasted ciabatta baguette and are served in a fitted long bag that's meant to make them easy to eat on-the-go. This time around, Pannidos are available in two new varieties: Turkey, Bacon, & Cheddar and Deli Trio. 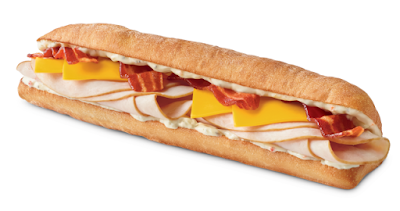 The Turkey, Bacon & Cheddar Pannido features smoked turkey, bacon, cheddar cheese, and creamy Italian sauce. 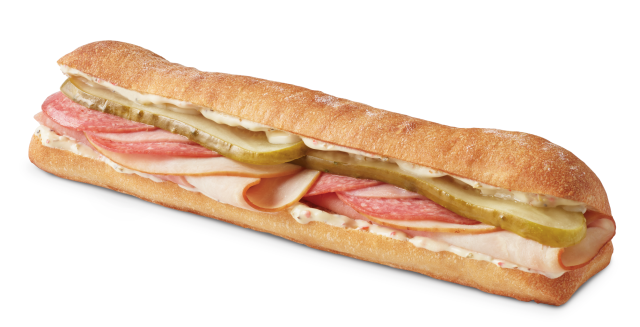 The Deli Trio Pannido is filled with smoked turkey, ham, and salami along with pickles and creamy Italian sauce. The two varieties mirror the similarly-named versions of the since-discontinued Grilled Sandwiches Jack in the Box launched back in 2010. The Pannidos will be available nationwide for about eight weeks for $4.99 each (may vary). Photos via Jack in the Box.